Stephen Downward 9364c717cb Added ICSP header. Board layout updated. This is my take at an APRS transmitter: The μTracker(pronounced MuTracker). It measures 4.5x2.4cm, making it the world's smallest, and draws under 20μA in standby, allowing it to run for months, or even years, when asleep. 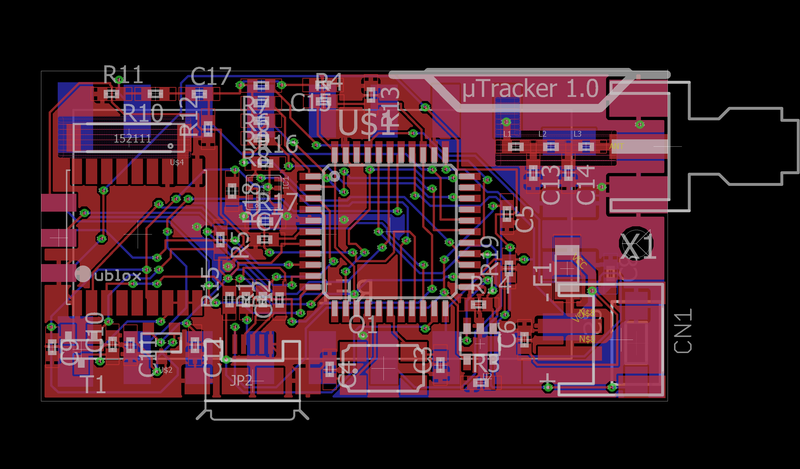 The tracker features a micro USB port for charging and programming the ATmega32u4, which controls the board. A JST connector allows for any sized 3.7v lithium-ion battery to be attached, allowing for customization of size and battery life. The entire back-side of the PCB is used for the DRA818V transceiver, which is the largest part by far, and provides a modest 0.5W/1W signal to the SMA connector for transmission. It is also the most power-hungry part, drawing 750mA when transmitting at 1 watt, and 400mA when transmitting at 0.5 watts. Because of this, it is important to limit the frequency of transmissions to prevent running the battery flat. The u-blox MAX-M8Q, the onboard GPS, is both low cost and extremely small. The tracker can safely be used while being charged - in fact, there is no way to turn it off without removing the battery. This is thanks to the onboard MCP73831T, which also limits the charging current to 500mA(adjustable by replacing a resistor) and prevents an overvoltage situation. This hardware and software is licensed under the GNU General Public License Version 3. For more information, check the LICENSE.md file.